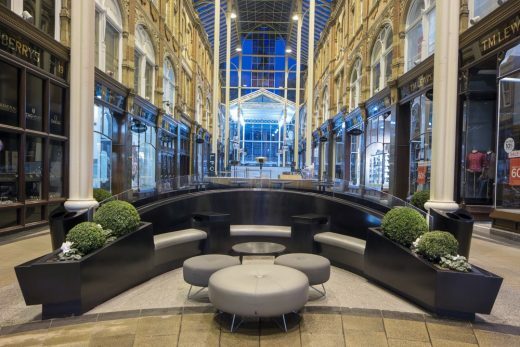 How do you make a strong yet elegant and cohesive design statement that will connect a historic Victorian arcade with a modern retail setting? 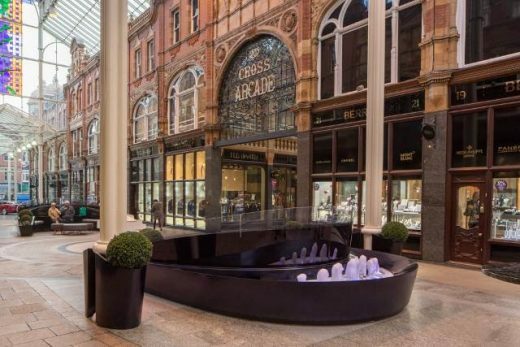 This was a key challenge for Object Space Place, the architects commissioned to create landlord furniture and kiosks for the Victoria Gate and Victoria Quarter shopping centres in Leeds. In the search for contemporary yet timeless materials and finishes, Corian® became a key solution to forming welcoming yet robust installations. 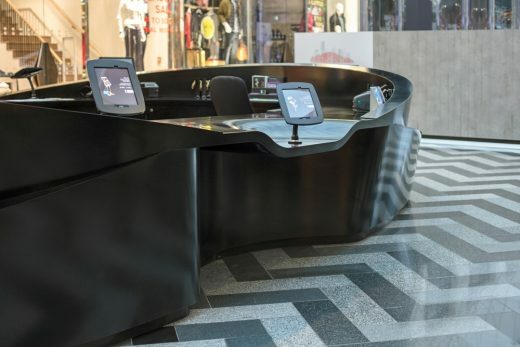 Running through the shopping arcades are a series of elliptical information desks, plus seating booths and other elements, all formed from the refined beauty and adaptability of Corian®. In the recently introduced Deep Nocturne colour, part of a series of rich, saturated dark tones made with DeepColour™ Technology, these organically flowing elements make a distinctive impact while offering multi-functionality. 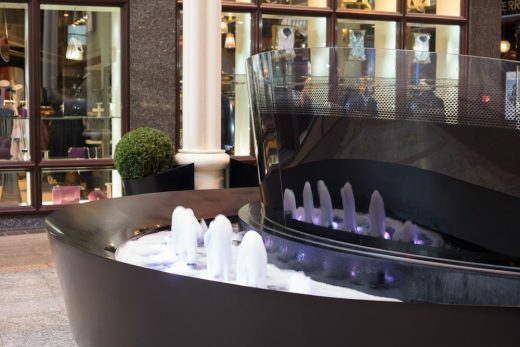 This go-to material for designers seeking just the right combination of panache, versatility and performance has been fully maximised here to create customer service desks, retail kiosks, inviting seating with integral fountains, waste bins, planters and advertising screens. 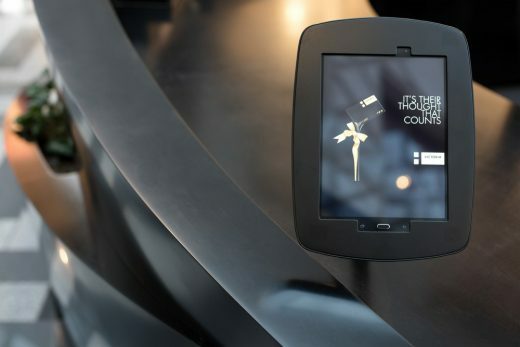 The malleability and homogeneity of Corian® makes it ideal for incorporating elements such as water or horticultural features, and for the contemporary necessities of IT and AV equipment, interactive touch screens, etc., making it the material of choice for upmarket retail, hospitality and leisure environments. 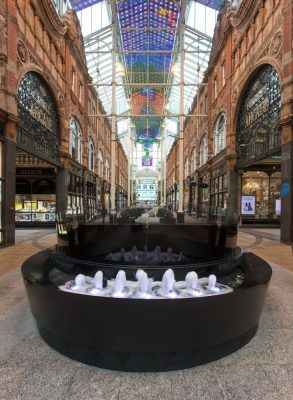 Object Space Place were appointed by clients Hammerson to design installations within Victoria Quarter, and also for the new Victoria Gate arcade, designed by Acme. The installations were fabricated by Gariff Construction Ltd, skilled Industrial Partners in the Corian® Quality Network. First created as a high performance material for kitchen and bathroom surfaces, offering a unique combination of functionality, versatility and sophistication, Corian® has evolved into world-class surfacing solution for interior design and architecture. In over fifty years of exceptional reliability, elegance and service, Corian® has become a valuable design tool for multiple applications and environments, from kitchens to bathrooms, healthcare to hospitality, retail to leisure, workplace to commerce, and whether for lighting or furnishing, work surfaces or service counters, integrated IT or AV systems, interior cladding or exterior facades. September 7, 2017 in Products.